I love raw little neck clams (Quahogs) and really pile on the condiments...lemon juice, cilantro, and cocktail sauce...that's probably why I didn't see this big pearl, which I found in my mouth, thinking it was a rock or something. 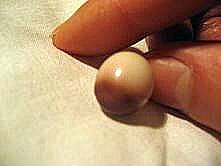 As you can see it's a two toned pearl and quite large. I had it weighed at a pawn shop. It weighs 2.9 grams which translated to carats is 14.5 carats. Kari is working with me at selling this. I may not get millions for it, but a couple extra thousands will really help me out right now. Kari's Note: I was able to find a buyer for Chiayi's pearl who paid her $2,700 for it. Chiayi was thrilled for the extra cash from an unexpected find in a few dollars worth of Little Neck Clams. Yes, I hope to have a buyer! Yes, I hope that Chiayi is able to sell her pearl. Since it wasn't heated there's less chance of it being cracked or it's luster being dulled. I agree with those who realize that even a thousand or two for a totally unexpected find is a bonus to one's finances. I love hearing about these pearls and seeing the photos. It must be a real thrill to find one, especially one so large.